Ann Xu is an illustrator and comic artist currently based in Baltimore, Maryland. Xu grew up in San Jose, California, and graduated from the Maryland Institute College of Art (MICA). Her work can be found on the women-focused newsletter The Lily, published by the Washington Post, and has an upcoming comic featured in The Believer's June/July issue. Read more about her work and process below! Your work always has fantastic texture and line quality, what are your favorite mediums to work with, and what is your process usually like when approaching your pieces? Nowadays, I mainly have two modes of working I like to use: if I want thin ink lines, I like to use a very basic fountain pen, and for something more shape-based, I’ll tend to use a dark color pencil. Graphite is fine too, but I prefer color pencils because they’re less shiny and a little more crayon-like. If I’m planning a piece with less detail or simpler shapes, I’ll use pencils, but if I know I want to go wild with line detail I’ll use the pen. Does this process change when approaching narrative works? I don’t think it changes much; a lot of it is also just the vibe I have in my head while I’m thinking of what I want a drawing or comic to feel like. Or if I have one particular thing I want to draw in a certain way, then everything else will fall in line behind that. In a comic I did for an anthology called The Sun and the Wayward Wind, during planning all I knew was that I wanted to draw a lot of smoke and fire, and I wanted to build up all the smoke using pencil, so that’s what I decided to use for everything. Your work often features dreams, such as the dream sequence in Sleeper Train, or the drawings based on dreams of your own in your autobiographical work March Snowfall. How do you think your dreams influence your work or daily life? Do you keep a dream journal? I don’t keep a dream journal anymore, but I used to do that a lot when I was a kid! I was really into lucid dreaming, so I would record my dreams in a lot of detail so that I could be in that mindset. Nowadays I only really take notes about a dream if it was particularly memorable or interesting, although I do have some more nightmare-adjacent dreams in the back of my head for making into comics sometime. I simply really like the feeling of dreaming, where anything can happen and you’re alone in your thoughts. They’re also quite vulnerable and I love having moments of honesty in a comic. You also have several works about moving, traveling, or generally being in transit. Do these themes come from your own experience? What draws you to that narrative? Yeah, I did White Tape the earliest, and I was thinking of it as the prologue to something longer, so the main character’s family moving in that story was a way to set her up in a new situation. When I drew Sleeper Train half a year later I realized that I had accidentally written almost the same thing into the story—a girl moves a long distance away because of her parents. The theme of moving is definitely there in both, but for different reasons. Sleeper Train is much more personal to me. Every time I go back to China to visit family, there’s just so much traveling involved. The train ride between my parents’ hometowns is about 8 hours long and I have a lot of memories of those trips, climbing onto the top bed and lying there between waking and sleeping while the train clatters around me. I love the empty scenery and the long hours spent alone, even though you’re also frequently in the company of strangers. And I think in the case of Spring Break, a lot of the appeal of the bus ride to me was also the feeling of independence. Like if I really wanted to, I could just buy a ticket and get on a bus for half a day to go see my best friend in another state. Can you tell us about your piece in Arboretum, Princess? I always liked The Tale of Kaguyahime when I was younger, which is about a moon princess who was found as a baby inside of a stalk of bamboo. The piece I made, “Princess,” isn’t so much directly based on that as it is inspired by the feeling that folktales like that give me. I think in general, stories about princesses and girls who were shrouded in mysteries really appealed to me, as well as the idea of people being born from or found inside of plants. When I was thinking about the theme of Arboretum, I kept coming back to Kaguyahime. What are some narratives you want to tell in the future? Is there anything you’d like to explore more within your work, technically or content-wise? I definitely do want to try writing more fiction. Personally I feel like that’s a weakness in my skill set. I made a sci-fi-ish fiction comic a year ago that I just haven’t been fully satisfied with, but I might try going back to that sometime. I love autobio and won’t stop doing that, but I want to be able to write and draw all kinds of things. I want to keep polishing my writing and drawing to be not only more technically competent, but more sensitive and emotionally detailed. Who are some of your favorite artists right now? What other media or sources do you take inspiration from? I love Niv Sekar and Carolyn Nowak’s illustrations and comics. They have very different ways of working but they both have really great skills in conveying emotional depth. I read Nowak’s Diana’s Electric Tongue last year and it just changed me. Other than specific artists, I do also love turning to anime or manga for notes on atmosphere and feeling, which I think a lot of them really excel at compared to Western media overall. Any last thoughts? Where can people find you on the internet? You can find my website at annixu.com, and I’m on Twitter and Instagram @epershannd! Foodies & Synesthesia Opening Reception next Friday! We are thrilled to welcome you next Friday for the opening reception of Foodies & Synesthesia! The opening reception is April 27th from 7-10pm! 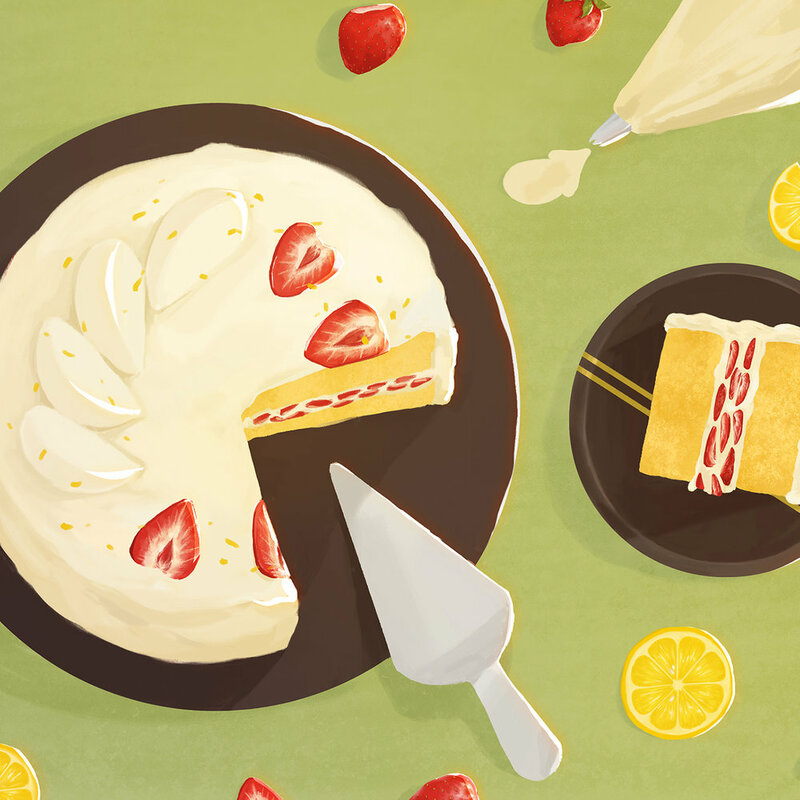 The Foodies exhibition calls upon 90 creatives to share their love for food through limited edition recipe postcards, which include beautiful and unique food illustrations inspired by hometown favorites, local ingredients, and the artists personal favorite dinner dishes. As a collaborative project, each of the contributing artists is receiving a complete set of recipe cards in a wooden recipe box to share, use, and cook with. Artists are creating a variety of dinner entrees, side dishes and desserts for the perfect date night at home. All artwork will be available through the Light Grey Shop and website. Arboretum + Spring Exhibitions Opening Reception! 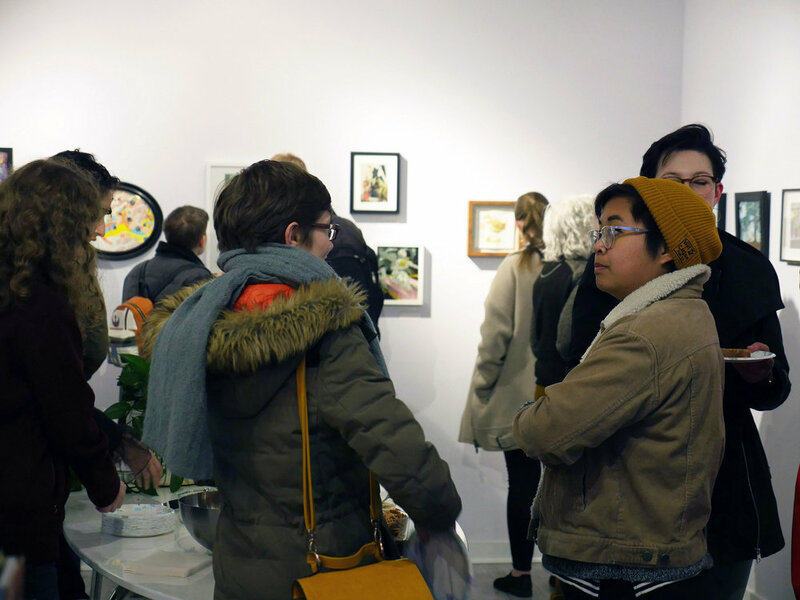 Last week was the opening reception of our Spring Exhibitions here at Light Grey Art Lab - thank you for everyone who was able to stop by and support the shows! Arboretum, The Flush of Spring, Resurgence, and Campfire Comics & Stories is now on display through April 20th! You can view all of the pieces on the Light Grey Shop and online galleries here! The Arboretum Exhibition includes the work of 70+ illustrators, designers, and creatives from around the world. Each artist took on subjects of botany, the history of tree species, enchanted forests, mythology, and designed garden spaces. Along with the original pieces, you can read about the research and inspiration behind these botanical explorations! The Resurgence Exhibition is all about themes of renewal, emerging after the long winter, change, and growth. The show features the work of ten illustrators through screen prints and riograph prints, embroidery, and archival prints. The Flush of Spring is a show about renewal, energy, and flux, and the spirit. Our lives, too, exist in seasons; they ebb and they flow, energy enters and exits, we experience true beauty and true pain. This show features makers whose work is itself fluid, active, poetic, and experimental. And it was a huge honor to feature the release of a brand new local anthology. Campfire Comics and Stories is a risograph-printed anthology zine published by Dennis Madamba and Kyle Harabedian that features work by fourteen international artists. Each artist takes a turn telling a story around the campfire. The theme is “Based on a True Story” and artists comics feature intimate moments, conversations over tea, train rides, and memorable personal narratives -- a lovely collection of illustrated stories. You can view more photos of the exhibition and opening reception on the Light Grey Flickr page here! And click the links to view the galleries of Arboretum, The Flush of Spring, Resurgence, and Campfire Comics & Stories. We are thrilled to announce the artists and collaborators of the upcoming Foodies exhibition! Mark your calendars for April 27th, 7-10pm at Light Grey Art Lab for an international exhibition about family recipes, smells, and tastes of home, as 90+ artists share their personal recipes and kitchen favorites. CALL FOR ARTISTS: FOODIES! - CALL CLOSED! We'll be posting the participating artist list soon! Thanks for submitting! You've got about forty minutes before you have to be at their house. The ensemble of sounds and smells fills the kitchen, and you dance between stove, to sink, to cutting board, and back, just like you've done for years. This is your specialty. Muscle memory has kicked in, and instinctively, you weigh a pinch of salt in your hand before throwing it into the skillet. You can tell by the texture that it's almost there. You dip a spoon into the mixture and taste. We are looking to create the ultimate global potluck featuring home-cooked dishes from food-loving artists around the world. FOODIES is an exhibition featuring imagery of dishes we love to cook. In addition to exhibiting work about the food we love, each participating artist will receive a recipe box filled with the dishes from each artist involved! The big concept is to try to bring home-cooked food to each others tables through sharing what we all like making at home! You'll be able to suggest alternative ingredients on the recipe card (say, for example, you want to make a vegetarian option suggestion, or a gluten free option...) as well as provide any information you'd like about the history of the dish / ingredients via the didactic that will accompany the work in the physical and virtual galleries. During the exhibition, we'll be asking artists to create an work of art that is 6" H x 9" W that features a compelling image of their chosen dish, as well as a limited edition of 100 4" x 6" double-sided recipe cards featuring that image on one side, with the recipe for how to make it on the other. THEN, we'll display the original in the brick and mortar gallery (this could be in any medium!) along with #1 of the edition of the recipe cards, and each participating artist will receive a complete collection of recipe cards from the FOODIES exhibition (one from each artist involved.) The remainder of the recipe cards will be for sale at the gallery along with the original work for the duration of the exhibition. We are looking for artists that wish to cook with us and share their special dishes with others! The work will be displayed in our brick & mortar gallery in Minneapolis as well as permanently archived on the Light Grey Art Lab exhibition site, priced by the artist, with our standard gallery commission of 60% / 40% in favor of the artist. We do offer printing services to help people that would like to submit without having to ship a piece, as well as frame rental for those interested. More information about print on demand services or other show specifics will be sent to all participating artists as soon as the jurying is complete! If you'd like to be involved and create a piece of work for this upcoming show, please put your name, email, and links to your work online below in the comments section by MARCH 26th! We will be jurying the exhibition as the entries are received and we will be notifying all participating artists via email with more information about the exhibition timing, sending artwork, and the other participating artists by March 28! March 28: Artists Announced on or before this date via email, blog & social media. Artists receive all show info via the artist log-in page. April 27: Exhibition opening reception at Light Grey Art Lab in Minneapolis and online! This is a VERY FAST call for art, as we have a lot going on at the gallery this month! But, if you are quick and you would like to be a part of the show, please apply in the comments! Spring Exhibitions at Light Grey Art Lab, Opening March 23rd! Join us for the newest shows coming to Light Grey this spring! We have four brand new exhibitions that celebrate the concepts of renewal, botany, forests, and our relationship with the natural world. The show opening Friday March 23rd from 7-10pm, features over 100 creatives that delve into the various expressions of the season! Arboretum Exhibition about Botany: Genetics, Enchanted Forests, and Designed Garden Spaces. The importance of trees goes way beyond their mythology. The rich ecosystems within old growth forests are expansively diverse and complex. The woodlands help provide infinite habitats for creatures, support highways of connective fungal networks which transport energy, nutrients, and information through the forest floor. The Arboretum Exhibition features original and framed work by 70 creatives from around the world. The work includes illustrations, small drawings, plein air paintings, and expressive botanical images that explore the botany of trees, natural patterns, curated spaces, mythology in the forest. Campfire Comics and Stories is a risograph-printed anthology zine published by Dennis Madamba and Kyle Harabedian that features work by fourteen international artists. Each artist takes a turn telling a story around the campfire. The theme is “Based on a True Story” and artists comics feature intimate moments, conversations over tea, train rides, and memorable personal narratives -- a lovely collection of illustrated stories. Resurgence Exhibition is a small collection of prints, screen prints and art originals that are all about the return of vibrance and energy that once was lost. As the grey winter comes to a close, all matter of flora and fauna emerge from their dormant states to take on the new season with a burst of color and purpose. In Resurgence, artists create new work inspired by the concepts of spring, renewal, and potential. The Flush of Spring collection at Light Grey Art Lab celebrates a metaphysical time of change, of rebirth, of flux. This exhibition features makers whose work is itself fluid, active, poetic, and experimental, where the work shown exemplifies the idea of rebirth through the process of creating new paintings, comics, and offset prints. Spring is a time where a sleepy veil is lifted from all that is organic; our psyches leave their hibernation, the muscles of our bodies release their tension. The imagery conjured by this state of re-awakening speaks of rediscovering elemental oneness with the earth around us, of finding new love in the mundane, and of reconnecting with the experiential. The opening is free and open to the public- come on by to support the artists! The artwork will be on display through April 20th and available through the Light Grey Shop. A huge thank you to everyone who applied to the upcoming Arboretum Exhibition this Spring! Please mark your calendars for March 23rd, 7-10pm for the big celebration! CALL FOR ARTISTS: ARBORETUM - CLOSED! The light was waning as he scraped the edge of a sharp rock again against the bleeding birch. It was becoming hard to see, but it was important that this message be finished before nightfall. "Let this be a warning to you," he muttered under his breath. The lines stacked up in a vertical tower, just like hap-hazard scars of an old, stitched wound, sap beginning to ooze from the fresh cuts. The papery bark of the birch curled away from the cuts just barely. The message was clear. Oghams were the early medieval alphabet of the Irish during the 1st century - 9th century AD and is a representation of letters corresponding with the trees of Ireland, Wales, and Southern England. Each letter not only held symbolism represented by the glyph, but the inherent qualities of the woods they represented. Whether the medieval language was first created as a secret way to send messages by druids, or as an alternative to the latin script, the true reason remains unknown, but the glyphs can still be found preserved in old churchyards of the British Isles. The importance of trees goes way beyond their mythology. The rich ecosystems within old growth forests are expansively diverse and complex. The woodlands help provide infinite habitats for creatures, support highways of connective fungal networks which transport energy, nutrients, and information through the forest floor. These are places where time stands still and we can see a window into how life on our planet would be without the presence of man. Here, in the forests, we find elements that house the fundamental basis for new medicines, and the presence of natural chemicals that assist in cancer research. There are amazing sustainable and unique food sources found here that are nowhere else on the planet. This March, we are looking to investigate the nature of botany and will be offering additional programming, lectures, and podcast content around how tree and plant life influence our world. We'll talk with furniture designers about the history and aspects of hardwoods, learn about sustainable harvesting techniques and the impact of global deforestation, learn about the presence of leaves in heraldry, and the homeopathic benefits of certain leaves, flowers and seeds. We are looking for artists that wish to investigate trees with us, in any aspect of their importance. If you'd like to be involved and create a piece of work for this upcoming show, please put your name, email, and links to your work online below in the comments section by FEBRUARY 28th! We will be jurying the exhibition as the entries are received and we will be notifying all participating artists via email with more information about the exhibition timing, sending artwork, and the other participating artists by March 2! March 2: Artists Announced on or before this date via email, blog & social media. Artists receive all show info via the artist log-in page. March 23: Exhibition opening reception at Light Grey Art Lab in Minneapolis and online! Meet Samantha Longley, a Minneapolis-based ceramic artist who subverts traditional pottery with unique, fluid flourishes. Samantha attended a liberal arts college in St. Paul, originally for painting, but discovered a "profound relationship with clay" in her second year. She now lives in Brooklyn Park, where she also houses her studio. Read more after the break! Based on your artist statement, your relationship to your craft is very spiritual (not necessarily in a religious way, but in your connection to nature, the universe). Where do you find the intersection of ceramics and this spirituality? It's interesting that I chose ceramics, something so tactile and messy, to talk about something transcendent- but I actually think it is a perfect marriage. Being a spiritual person isn't always about transcending and getting out of your body, or out of this world in order to contact something pure; I believe the pure spirit, that flow of the divine is actually within and all around right here, right now, indwelling and constantly colliding with this world, in the nitty gritty, the unexpected and the mundane. I think this physicality can be seen as something to be escaped from most of the time instead of embraced, which is why clay is my muse. The process is not glorious; it's messy, frustrating, very physically involved, and rarely works the first time- but it creates a space for me to confront and embrace all my humanness. It is an expansion of myself in both directions; the somatic involvement pioneers the space for my spirit to open as well (sort of like yoga). It is a beautiful, mysterious, intriguing, and seemingly contrasting harmonization that I constantly seek and find a lot in my studio (the meeting of physical and spiritual that I talk about in my statement) and I get to provide a literal picture for others: infusing dirt with energy and idea and life. Ceramics is how I practice this harmonization and attempt to diverge from my regular dualistic living. How do you subvert traditional forms (cups, pots, etc.) to convey these feelings? Perfection is not something I strive for in my life or my forms. I have often heard adjectives like "wonky" or "smushed" or "distorted" to describe my work, which I fully embrace. There is a Japanese world view called "wabi sabi" which can be, very simply, translated as "beauty in imperfection, humility and impermanence", but it is much more than that; it is an entire way of being. The aesthetic that tries to contain its essence really challenges western notions of glamour, showiness and symmetry; Wabi Sabi ceramics can feature cracks, distortions, and asymmetry and yet, they are treasured and appreciated for their imperfections. My pots don't look like typical, traditional pottery that is found, which is how I have found a home in the Wabi Sabi aesthetic and mindset. My work is intentionally distorted, sliced, carved and crumpled in hopes of being more true to life which is full of movement, ebbs and flows, imperfections, and is absolutely beautiful when it humbly embraces those things. What’s your process usually like? Do you have a specific shape in mind when starting a piece, or do you let it form as you work? With my unique forms especially, it is hard to picture exactly what the outcome will be. For these functional forms, I begin with the right amount of clay (about 1 lb for a mug or tumbler), then start by throwing a cylinder on the wheel. When I get close to completing the base object, I sort of stretch it to its limit and hold the top of the form while the wheel is still spinning; this causes the clay to twist and create a lovely soft movement that is unique to every piece; it sort of looks like a wave or moving piece of fabric. Then, if I did it right, the clay will hold its form and it will be frozen in movement forevermore. With my newer, more sculptural works that I cut into, I usually begin with an idea and a sketch, but the beauty of ceramics is that you can't always control it. Sometimes it will take you down a different path, and I like to ride that wave. It's good to have a starting place, but if I am trying to follow a 2-D sketch exactly, I don't feel like I'm being true to the nature of the medium and the movement I’m trying to capture; like trying to carve a line around a 3-D form. How to follow a flow around its curves is something you figure out in the moment. What is it like to be a Minneapolis-based artist? What makes this community unique? Being an Minneapolis artist is the best! I love making connections with fellow artists through sales and arts events- it's actually really easy to do since these folks are some of the nicest, most open people I know. I think what makes this community unique is that it feels like a community, not a competition. As creatives, we have an instinctively deeper understanding of one another and can easily bond over the joys and hardships of working as an artist. All of the makers I've met seem so open to connection and are very genuine people; it has helped me to open up and feel proud of my work and comfortable just as myself. I have been so encouraged and embraced by fellow artists in the community, even while working out of a secluded home studio. I'm so proud of this community, the creative, earnest, and beautiful work they make; I love that it is my home! Where do you see your practice going in the future? Do you have any dream projects you’d like to work on? My hope is to become more and more committed to my work and practice and to move into a larger studio space outside of my home within the next few years. I don't have a clear picture of what I imagine for my future, but I don't let that hinder me from progressing; just as my work begins with a small idea, then grows and evolves and leads me on, so do my dreams. Who are some of the other local makers whose work you’re really excited about? I love to see what other ceramic artists are doing around me, how they’re being innovative and original within the same medium. I am intrigued by Brett Fruend's extravagant aesthetic exploration in function and just wish I could reach through screens and touch his crystal formation cups forever. I'm also a huge fan (and collector) of Adam Gruetzmacher's work (note from ed. - see our interview with Adam here). It always seems fresh, like he's constantly innovating and never bored with the process. It's really inspiring to me. Autumn Higgins brings me into those quiet, sweet everyday moments with her gorgeously illustrated pots, and I am always inspired by Liz Pechacek's fascination and play with form. 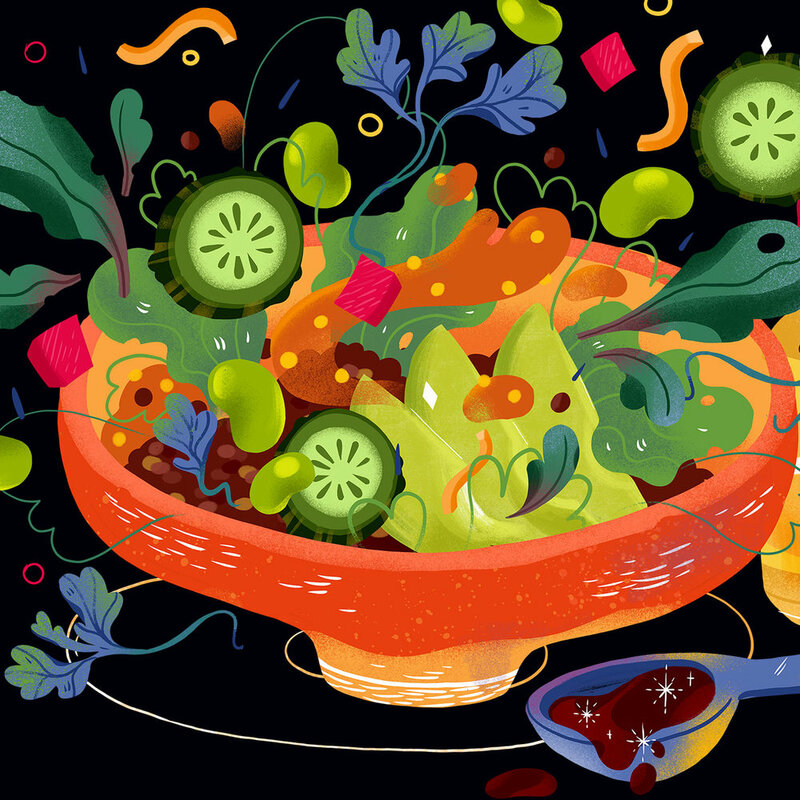 On a 2D note, I am also really digging Kelsey Oseid's (Kelzuki) fantastic illustrations lately! I love having those beautiful depictions of nature around; they make me so happy and I could look at them all day! I also enjoy Michelle Brusegaard's (MBMB) frankness and play with design over anything and everything. Before I leave the house I am usually wearing my edgy witch's finger power necklace by Betty Jager (3 Jag Design) and/or some beautiful lichen filled jewelry by Sudify. I am a proud owner of a lot of really superior local art and goods. See Samantha Longley's work in Winterland, and visit her website here! The opening of Winterland was incredible! Thank you so much to all of the participating artists, both in the main show and our one-night pop-up shop! We are so happy to see all the new and familiar faces, and to see so many people making it out even in this cold weather! 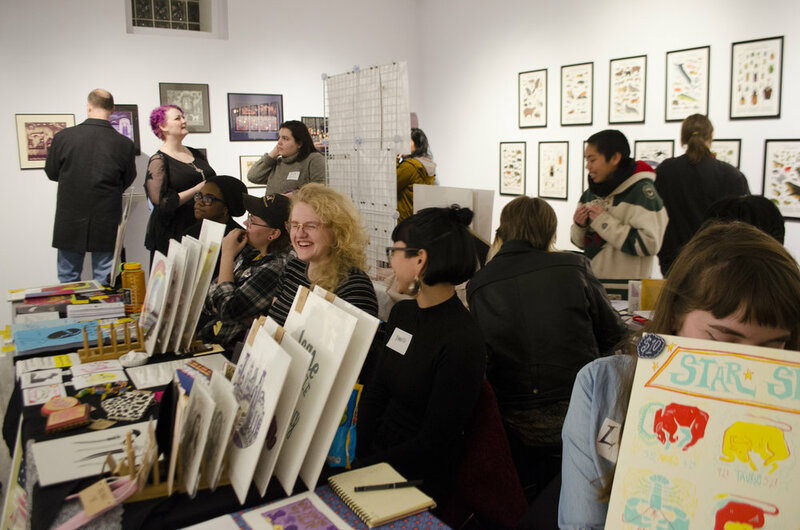 The pop-up shop featured local artists selling prints, zines, pins, handmade sets of runes, and more. We were also thrilled to have our neighbor Bingley's Teas in the gallery, demonstrating the Gongfu Cha way of making tea for anyone interested in participating. Our friends at Common Roots Café also provided a tasty tray of baked goods for refreshments. We got to see many of our Minneapolis maker friends at the opening as well, and it was wonderful chatting with them about their products and processes! If you were able to make it out, we hope you had as good of a time as we did! If you weren't able to stop by, the show will be up through February, and you can also find all of the participating makers' collections on the Winterland webpage. For more photos from the opening, check out our Flickr page here! Meet Adam Gruetzmacher, a craftsperson and ceramicist living in St. Paul, Minnesota. Originally from Oshkosh, Wisconsin, Adam attended the University of Wisconsin-Stout, graduating in 2010 with a BFA in Studio Ceramics. Read more about his practice and what drew him to the medium below! Hi Adam, How long have you been working in ceramics? What brought you into it? Counting college, I’ve been working with clay for about 12 years. I like the act of making and it is important that my efforts result in something useful. I was attracted to clay in school because it was the most challenging and demanding medium. I am never bored and never stop learning. My studio takes up the majority of the basement of our 1200 sq. ft. house in St Paul. It has a finished ceiling, tile floor, and plenty of florescent lighting. It’s not the dreamiest studio in the world, but very real, very functional, and I feel lucky to have it. Do you have any philosophies attached to your craft? How important do you see the act of creating handmade goods in this day and age? As someone who makes useful objects there are three planes of thought that I reference. Firstly, I rely on my applied arts education wherein the foundations are based squarely on the concepts of design. Secondly, I strongly relate to the ideas and tradition behind craft and craftsmanship, which informs my approach to the materials that I use and the way in which I make. Thirdly, I reflect on my values as a person to ultimately evaluate my work and add an element of humanity. I am successful when I have made a well-designed, well-made object that I feel is an honest distillation of my personal values. What is your process usually like? How did you develop your individual techniques? I use traditional wheel throwing and forming techniques, mixed with some occasional cutting and altering to create linear structure in some forms. I think the repetition associated with any traditional craft naturally leads to the development of technique, which is visible in the finished piece. As the maker grows more skilled in his or her craft, the work more closely reflects the person who made it. This process of developing identity through the physicality of the work is a special aspect of handcrafts. There is no better place in the country to be a potter. There is a lot of studio pottery history in this specific region of Minnesota and there is great public support for the continuation of the craft. I feel lucky to have ended up here. Where do you see your practice moving towards? Are there any new techniques you’d like to try in the future? I am open to anything when it comes to my practice. In the last couple years I have become interested in carving green wood spoons. I don’t know a lot about my family, but I have a collection of spoons and scoops used by my grandmother and likely made by my great uncle- and it feels good to practice a craft that can connect me in some way with the history of my family. The more materials and craft concentrations that I explore, the more I understand the cultural and personal importance of the act of making useful things by hand- no matter the medium. Are there any other local makers whose work you’re really excited about? I’m excited about the broader art and craft scene in Minnesota. It seems like this state is covered in people who make things by hand either to explore new ideas or maintain and rediscover craft traditions that do not exist anywhere else in the country. We have a wonderfully supportive public and it’s exciting to be a part of it all. You can see Adam's work in the Winterland show in the gallery or on our website, and visit his website here! We invite you to join us next Friday, January 26th from 7-10pm for the opening reception of Winterland! We are thrilled to host this exhibition that celebrates Twin Cities-based creative endeavors, small businesses, and creatives of all types! Come check out their artisanal soaps, hand-beaded jewelry, carved spoons, furniture, original illustrations, sculptural objects, ceramics and more! All works will be available for purchase during the opening reception -- come meet the artists, support their business, and celebrate the community! You can see the full list of participants and details on the Facebook event page here. Winterland is about the craft, process, and ethos of each creative. Samantha Longley is a ceramic artist from Minneapolis; her porcelain wares are handmade on the potter's wheel and given a unique twist... literally. The soft movement, individual to each piece, is gently and purposefully given while the work is fresh on the wheel. Her work is an exploration of form and a celebration of beauty in the imperfect. Simple Soaps is a women-owned company based in Saint Paul, MN, founded with the mission of putting better, simpler, more naturally beautiful skin care products into people’s hands. They will be showcasing a variety of bath and body products. A non-traditional book club for people that want to have coffee, tea, and conversations about great books. Join us on January 28th for our first book club at Light Grey! We’ll gather around the table for a fun morning discussion about big concepts, characters, tangents, and nerd out about some of our favorite subjects with lovely people! Bring the book you are reading — nonfiction, fiction, biographies, art books, comics, etc. all welcome! We look forward to finding new content and getting to know each other a little better through out ideas and favorite stories! All are welcome, so feel free to invite friends and book lovers! Join us for a two and a half hour workshop in understanding the Tarot and it's many uses as a predictive, reflective, and therapeutic tool. This workshop will cover how to use Tarot to reach the deepest recesses of our minds via automatic journaling. We will discuss how to use the Tarot as a vehicle for introspection, and learn how to build a daily journaling practice that is easy, freeing, and insightful. We will discuss effortless ways of connecting with the cards, how to look for symbols and signs within the imagery to help draw out our own subconscious themes, and what re-reading our own writings can do to improve mindfulness and personal progress. One and three-card introspective mini readings will be discussed during the workshop as well to improve depth in our journaling exercises. This workshop is one in a series of Tarot workshops / meet-ups at Light Grey. Look for more upcoming Young Mystics classes and related make-and-take workshops this year! We plan on hosting some study groups, related get-togethers and more for people looking to explore their mystical side. Tarot is mysterious --- with it's esoteric symbolism, loaded imagery, archetypal characters, and taboo connotations. This workshop will explore the different ways of using Tarot, and how to decide the best way to approach using Tarot to enhance your self-understanding. This workshop is for beginners AND practiced readers and is an opportunity to revisit one's practice amongst like-minded folks and to introduce new reading techniques. We’ll practice reading with a few new spreads in class, so participants can practice their new knowledge with others! Join us for the opening reception of Winterland, January 26th, as we celebrate exceptional makers in our community! The exhibition showcases work that blur the lines between product design and art, craftsmanship and aesthetics. Winterland focuses on the processes behind the craft, the ethos driving the makers to explore the materials and forms they create, and the experiential aspect of consumable works by those that use the items. The exhibition includes ceramic, wood, and leather goods, jewelry, cosmetics, handcrafted furniture, screen prints, original artwork, sculptures and more! The brands and individuals showcased exemplify the spirit of creativity and innovation present in our local community. Winterland featured artists: Jennifer Davis, Steph Kunze, Tenderheart Studio, Jenna Freimuth, Kim Bogeman, Kelzuki, Elana Schwartzman of Fontlove Studio, Anne Ulku, Gallow (Teagan White and Erica Williams), Alanna Stapleton, and Jesse Lindhorst. Pop-Up at Light Grey: Sarah Evenson, Jennifer Bowman, Fiona Avocado, Lucy Comer, Alex Mitchell, Puck Saint Comics, Alexis Politz, Keeli O’Brien, Nathan Motzko, Ari Mulch, and Alex Conkins, Kira Night. This event is free and open to the public. Come celebrate the local makers, creators, and businesses! Back in May of this year, we had the privilege of heading out to the Pacific Northwest with a bunch of incredible makers and all around rad human beings as we camped under the stars on Vancouver Island and in the heart of Olympic National Park. On the island, we woke to the sounds of Seals and Sea Lions of in the distance and filled our bellies before setting off on our daily adventures. We explored parts of the Ucluelet Wild Pacific Trail, had serene walks in massive old growth forests teeming with moss, and a rainy day in Tofino (on just about the most picturesque beach imaginable) where we donned our wetsuits and had a private surf lesson from the Surf Sister Surf School. In the evening, we huddled around the fire and conversed about anything and everything under the sun before crawling into our sleeping bags to prepare for the next day's coming adventure. After ferrying back across to Port Angeles, WA we met our awesome group that was going to join us in exploring the Hoh National Rainforest and the beaches of Western Washington. We visited the Makah Museum up in Neah Bay, Hiked the trails near Cape Flattery, and made lunch in the field as we sat among endless piles of driftwood on Ruby Beach. In the evenings, we'd swing by the Sol Duc Hot Springs for a much-needed soak in the warm water before returning to camp for dinner. A huge thanks to everyone who came along and helped make these trips incredible. We really miss telling stories around the fire, eating our "chicken-ish" stew, and singing along to 80's music in the van with all of you! MAKE MY HOLIDAY PARTNERS ANNOUNCED! Thanks to everyone that signed up for our 2017 creative swap! Below are your partners! If you've never participated before, here is some info for how to proceed! 1. Reach out to your partner and introduce yourself! Feel free to tell them a bit about what you like, what kind of creative work you do, and anything else you think would be fun. It's always nice getting to know someone through their interests, things they collect, stuff that is kind of fun and personal, and anything else you think makes you, you! 2. Make sure to ask for your partner's address! 3. 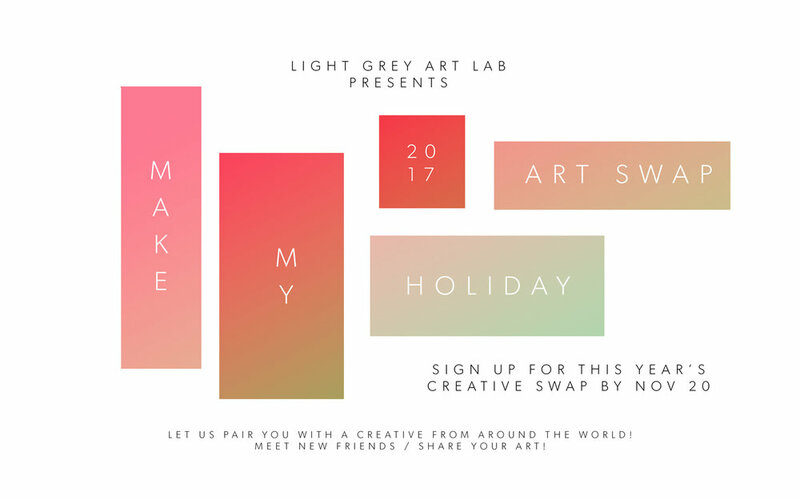 The art swap is open to any type of creative work! You do NOT have to make something new or custom, but we find that most people decide to do something special for their partners! As long as you made the thing you send, it's perfect. 4. Make sure to send out your gift before the end of the year so your partner can celebrate with you! If you think you'll be late, make sure to check in and tell your partner when they can expect a package. As we all know, the holidays are a time to travel and we wouldn't want anyone to miss receiving their package. 5. If you'd like, tag #lgalmakemyholiday or @lightgreyartlab on any images you share online! We'd love to see what you received / made for your new friends! ** If you have any trouble reaching your swap partner, let us know and we can try to help! THAT'S IT! Happy swapping and thanks for being a part of this year's Make My Holiday! EDIT: 11/20 --- Thanks again to everyone that entered this year's Make My Holiday Art Swap! We'll be announcing partners via email shortly! Please check your inbox for more info / your swap partner! Thanks again! Join us again for our annual Make My Holiday art exchange! Every year we gather friends new and old and pair them up to create new pieces of art for each other, all in the holiday spirit! Signing up is easy, just drop your name and email below, and we'll pair you up with another artist from around the world! The deadline for signing up is November 20th, and we'll announce your partner on the 22nd. Anyone can join, and anything can be made! You're welcome to make your new friend a zine, original drawing, hand-crafted object, or a brand new print, whatever seems fun and personal! The only rules are that 1.) You MUST make something for your partner (it's no fun if only one person is on board!) and 2.) You need to organize with your partner in order to get your item to them before the new year! When you receive your gift, we'd love to see pictures (and I'm sure your partner would as well)! Feel free to send all photos to calvin@lightgreyartlab.com! Light Grey Art Lab Annual Cookie Party! There will be prizes awarded for achievements such as Most Creative, Most Beautiful, Most Tasty so feel free to push the boundaries of even the most classic recipes and come armed with your cookie of choice! We'll have hot cocoa and milk, tea and coffee for everyone, so join us for a cozy couple of hours and eat your fill of cookies! Invite your friends and start baking, we’ll see you soon! A couple weeks ago, we were huddled behind a massive rock at the base of a waterfall. The unmarked path past Magic Road led up to the Mohan Waterfall, where we were surrounded by tall grass, colorful flora, and flocks of sheep. We sat in a mossy opening, reading tarot cards and talking about life. The mist rolled over the mountain and it felt perfect and serene. There were many moments like this -- of raw exploration, of camaraderie, and learning from the landscape and lore. We had the opportunity to travel through the southern coast of Ireland with some amazing creatives, Team Turlough and Team Rhyolite, for the Light Grey Art Camp International: Ireland Culture Tour. Throughout the program, we traveled around the Hook Peninsula and Copper Coast Geopark, exploring the shipwrecked beaches, picking wild blackberries, observing sea urchins, starfish and tide pools, searching for rocks and stripped quartz, and wandering through old abbeys, graveyards, and churches of the Knights Templar. We also visited the mediaeval cities of Kilkenny, Waterford, and Cork, learning about viking history, trade and imports, and touring through old castles, museums and observation towers. At night, we gathered for family-style meals at the pubs for live music, storytelling and seafood chowder. You can see more photos on our flickr pages from TEAM TURLOUGH and TEAM RHYOLITE. You can also find more details about the Light Grey Travel programs here.